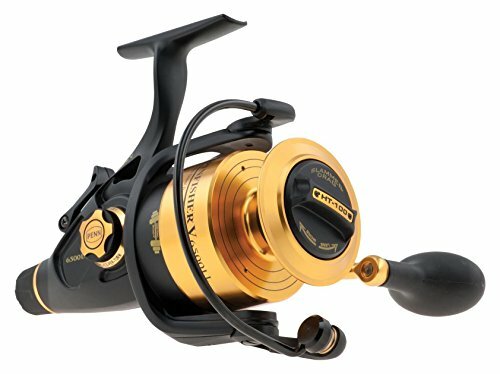 The Spinfisher has superseded the famous Penn Slammer reel which, for over fifty years was the benchmark for saltwater spinning reels. Very little changed with the slammer, as how can you improve on perfection? From wrasse and pollack fishing through to heavy duty big game cranking there is something in the Spinfisher family for you. For starters the bail arm has got chunkier giving you better contact for speed fishing or when your hands are cold wet and slippery. There is no going back with the Penn team designing this reel to be totally clutch dependant with only anti reverse in the 7500-10500 sizes. With a fully metal construction and sealed body, along with the stainless steel mainshaft and alloy gearing, Penn have produced a very special reel capable of handling all conditons and species. This model is the live liner version with a free spool system, resulting in easy line release while bait fishing for those hard hitting fish!